The Airports Authority of India (AAI) was formed on 1st April 1995 by merging the International Airports Authority of India and the National Airports Authority with a view to accelerate the integrated development, expansion and modernization of the operational, terminal and cargo facilities at the airports in the country conforming to international standards. 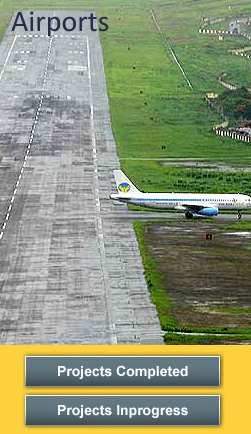 The airport has a single runway of 3,290 m (10,794 ft) in length, accommodating most wide-body aircraft in international service, although the most recent reports indicate no airliners larger than Airbus 320 types regularly serve Vir Savakar airport. An ILS (precision instrument landing system) is available for low visibility operations, but pilots are responsible to check with local authorities to verify the system is operational, prior to flight. There is a road that crosses the runway; traffic must be stopped for aircraft to take off, similar to the Gibraltar Airport. With such a small terminal and the isolation of the islands, flights that serve the airport are few and expensive. Despite the airport's "International" designation, there are no scheduled international flights, although occasional charters operate from Bangkok. Restricted Area Permits for the Andaman and Nicobar Islands are available on entry. There is only one terminal with 2 gates and no airbridges. Buses are used to provide transportation from the terminal to the flights in the apron. As of April 2009, construction work to add a second airplane parking bay is in progress. We have completed the work of “Extension of Runway by 5000 fts (1534.39 Mtrs) at Port Blair Airport, Andaman & Nicobar Islands SW: Pavement work, India” with a value of Rs.44.60 crores. Raja Sansi International Airport (IATA: ATQ, ICAO: VIAR), also known as Guru Ram Das International Airport, after Guru Ram Das Ji, the founder of Amritsar, as well as Amritsar International Airport, is 11 km north-west from the city of Amritsar, India. It is located on the Amritsar-Ajnala Road, near the village of Raja Sansi. It serves not only the city of Amritsar, but also the state of Punjab. We have completed the work of “Upgradation & Development of Amritsar Airport at Amritsar - SH: Resurfacing of existing runway, taxi-track and extension & construction of runway, taxi-track & apron” with a value of Rs.21.00 crores. Chennai International Airport (IATA: MAA, ICAO: VOMM) is located in Meenambakkam, 7 km (4.3 mi) south of Chennai, India. It is the third largest international gateway into the country and the third busiest airport in India after Mumbai's Chhatrapati Shivaji International Airport and Delhi's Indira Gandhi International Airport, and the main air hub for South India, handling around 12 million passengers in 2007 and serving more than 50 different airlines. It is also a hub for Jet Airways, Kingfisher Red, Air India and Paramount Airways. It is also an important cargo terminus for the country, after Mumbai. Construction of 5 Nos. Bays and link taxi tracks for Private ATOs at Chennai Airport, Chennai. Construction of 3 Nos. Bays and link taxi tracks for Private ATOs at Chennai Airport, Chennai.